can you share the battery dimension? For the replacement battery I found that the Turnigy 2000mAh 1S 1C Lipo w/ 2 Pin JST-PH worked perfectly while also being a budget option at only $2.54 USD before shipping. However ONLY INSTALL AFTER CHANGING THE POLARITY OF THE CONNECTOR, this can be done with a pin or craft knife with relative ease. After doing this the controller has doubled in battery life. It required no modification to the controllers internals only extra care to ensure the longer cables didn’t get pinched in reassembly. Hello. I got a new graffiti controller (without hardware) and i wanted to switch my parts in the graffiti one. I have a PS4 Controller. Not a slim. But it seems like my motherboard screw is on the other side.. its on the right side of the motherboard and my graffiti is on the left.. what controller do i need to fix this? Be very careful when you detach the touchpad ribbon. You could disconnect the other end that is inside the touchpad. In fact I would recommend you use a plastic spudger to release the clips on the sides of the battery holder, and then lift the latch to the ZIF socket of the touchpad. If your touchpad is not working upon reassembly, then the other end of the ribbon cable my have came loose in the touchpad. Use a plastic opening tool to remove the back of the touchpad, and lift the brown latch of the ZIF socket and reinsert. currently doing this and have found the desoldering part the most difficult. i purchased a 40w solder on sale and attempted to remove with flux and wick to no avail. a buddy of mine tried with his station and no dice. at this point im thinking the contacts are lead? any advice? So the springs are annoying couldn't see were you talk about these as it's very fiddly to do the last step of putting it back together. Not just a reverse of taking it apart! I concur. The springs are the worst part of this job. It would be nice if someone edited this to add some tricks for reassembly. You just have to put the r2/l2 buttons on the top side. There's a space around that white rubber thing where you can just snap them in. So that you have all the shoulder buttons together before putting the 2 parts back together. Thank you for this recommendation. Made disassembly SO much smoother. What I did for the Springs was place the spring on the button. Turned the button to where the spring is up on top then attached the button to the controller this helps keep the spring in place as you reattach it that is really the only trick that I found to it. One day my R2 trigger refused to work all in a sudden. The second day it spread to my square button. I dissembled the controller to this step and found some liquid between the green motherboard and the black plastic holding it. I should not have bought a second-hand especially for a launch version. Anyways I cleaned it up and it still didn't work. I then went to ebay and bought a new motherboard. Basically it is a piece of delicate plastic like PCB. It is held in place by 3 plastic columns and 3 gaps for sliding underneath both triggers and the touch pad. Sorry for no pictures but a careful removal of the old one would give you the best illustration of how to put the new one back. 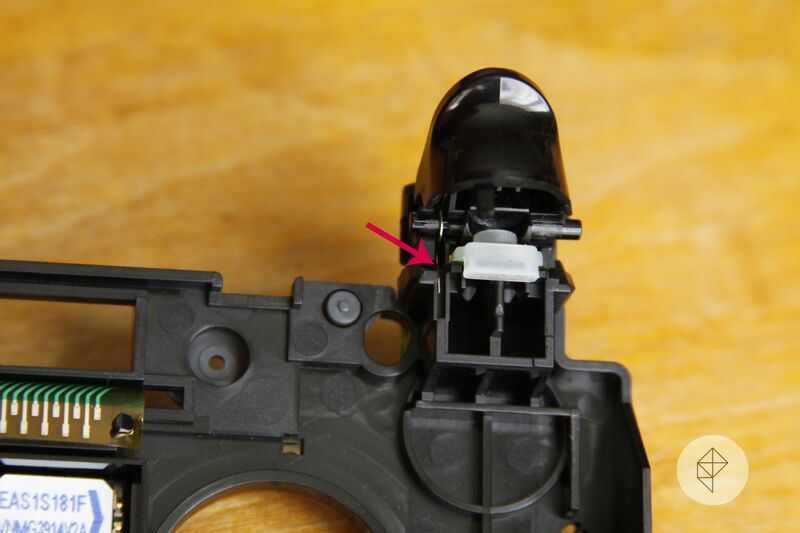 First remove the rubber pads of the triggers, which allows you to slide in the PCB. Then there are another 2 small plastic columns at the back of the gap near the touch pad. There is no need to detach the rotors. A pair of tweezers would help greatly. My controller now works perfectly like new and thanks to the author. I have 2 PS4 controllers but the ps buttons are not working on both controllers. I tried checking the status of the controllers using my laptop, all the other buttons worked except for the ps button (13). I have dismantled the controllers to clean up dirts around the buttons but it still didn’t work. I need help to get the ps button working again. Thank you. You might wanna make sure that flimsy plastic lining the buttons push is in its proper place. Sometimes it moves and if it doesn't line up just right it won't work. I took the "caveman" approach to this tutorial because I spilled soda near the controller and the circle button was sticky. It was an emergency operation done with a Phillips one size too large, a pocket knife for a spudger, and my cigar fingers for forceps. I must say, after some initial confusion, this tutorial helped me put it back together easily without breaking anything (a minor miracle all on its own). Thank for this. I need help. The up and right direction on the d-pad are not functioning. I took controller apart and made sure everything was clean and unfortunately did not fix problem. My question is has anyone else had this issue and if I buy a new silicon part for the d-pad will that fix it? My R2 button is constant being pressed. Even after I opened it and cleaned it. Please help me with this?? I connected it to pc and even removed the R2 button while checking for the buttons on pc,and button 8 (I.e R2 button on controller) shows as pressed all the time even when it's not there. The “up" button on my d-pad has not been working recently so I followed the tutorial (helpful by the way), found no obvious problems, put it all back together, but the button still will not work. Any tips? Are the contacts lining up right? That might be the problem. My vibration motor has fallen out and the wires are disconnected, how can I fix it? After I did this my right dpad button stopped functioning, is there a way to fix this? This is the original model. How about an update since there have been about 3 new assemblies and a new version of the DS4? Here is a solution to a broken R2 button. Really simple fix. My PS4 is registering R2 button input without me pressing anything on the Dualshock 4. How can I fix it? This is only apparent when I play games… For example, when I play Spiderman where R2 is used for sprinting and web swinging, Spiderman will alternate between running and jogging, without me actually providing any kind of input via R2.